Click twice on the panorama for the largest view! 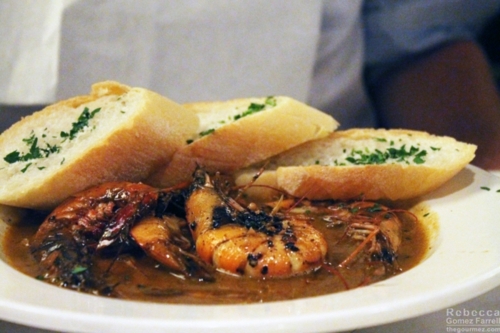 Why, you might ask, are you focusing on dining at night in New Orleans? Isn’t the food there good anytime? Of course it is! 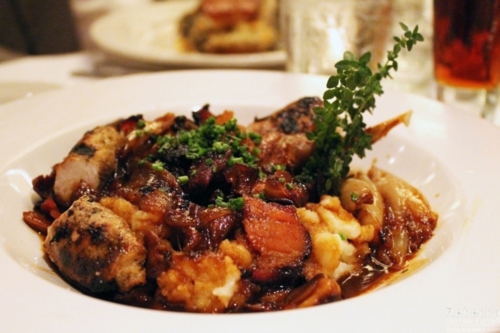 But one must make distinctions between their blog posts somehow, and with the massive amount of eating we did in New Orleans, I figured divvying up the meals by time of day made as much sense as any other reasoning. So yes, you can expect an Eats in the Day post in a few weeks. 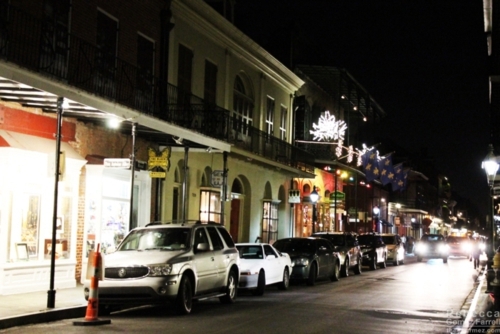 There will also be Drinks at Night coming up, and in all my New Orleans travelogues, sights found while walking through the streets will be interspersed. But I know you, you know me, and we all know that food and drink is our priority. So let’s dig in! Last travelogue, we visited the Abita Brewery, the Abita Mystery House, and the World’s Largest Ronald Reagan, all located around 40 minutes north of New Orleans. 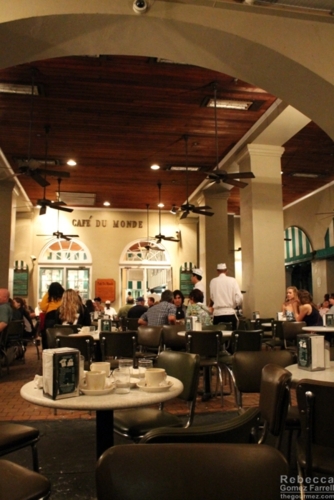 Our first stop, after checking into the awesome and humongous New Orleans Hilton Riverside (2 Poydras St.), was the New Orleans’ institution, Mother’s (401 Poydras St.). Proclamations from friends had assured me I would never hunger again after dinner there, so perhaps my expectations were a bit high. 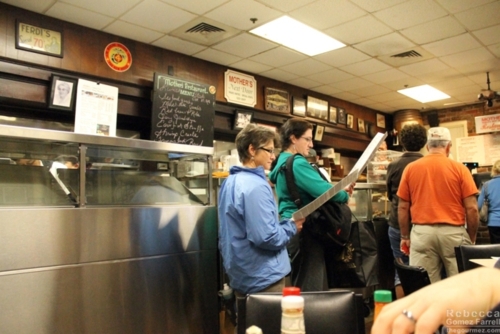 Waiting at the counter to order. Or perhaps I’ve spent too much time in the South. It’s the same meat plus three sort of establishment I’ve been to a million times by now, and I’m not that enamored with most Southern sides. I opted for the crawfish etoufée. 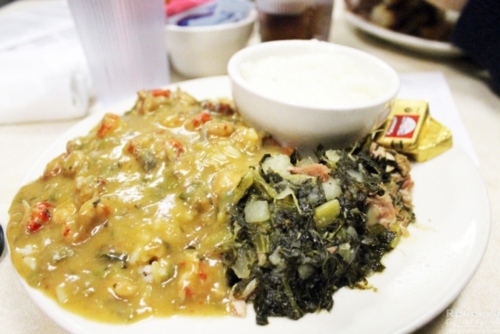 The sauce is smothering white rice, and my chosen sides were grits (lackluster) and collards (pretty good). The etoufée had a nice, deep roux flavor but no spice to speak of. 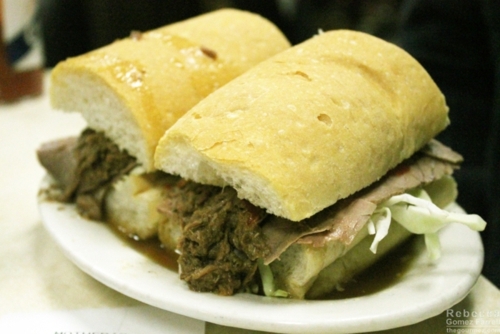 My husband tried their roast beef po’ boy. He was not impressed. It was drenched in juice, not that flavorful, and the bread was soaked through. 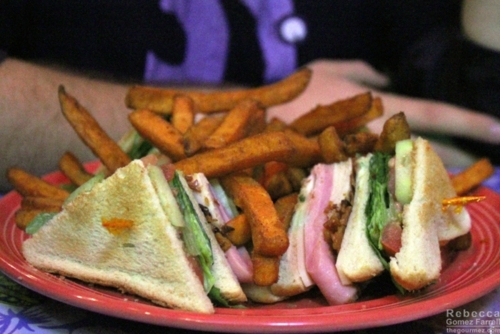 Perhaps that’s normal for a po’ boy, but none of the other ones we saw on this vacation were floating. You are all more than welcome to eviscerate our opinions of Mother’s in the comments—I know it has a lot of fans! Discouraged that Mother’s didn’t live up to the hype for me, we walked a few blocks from the Central Business District to get our first experiences in the French Quarter. 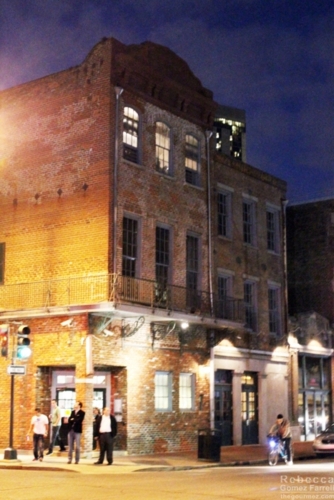 Typical French Quarter block at night. Crossing the French Quarter entirely, with a few drinks mixed in to sustain us, we eventually arrived at Fauborg Maurigny. 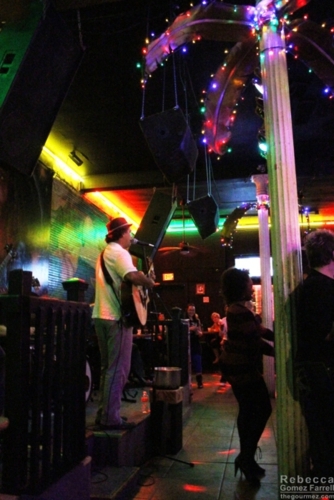 Frenchmen St. was our target, the prime spot for music lovers. Of course, there’s live music every night in many of the city’s restaurants and bars, but Frenchmen has a concentration of small clubs. Café Negril’s (606 Frenchman St.) huge mural of Bob Marley pulled me in, and I thought their cheap taco stand in back was a great idea. We stayed for a few songs then wandered across the street into an awesome open-air craft market. 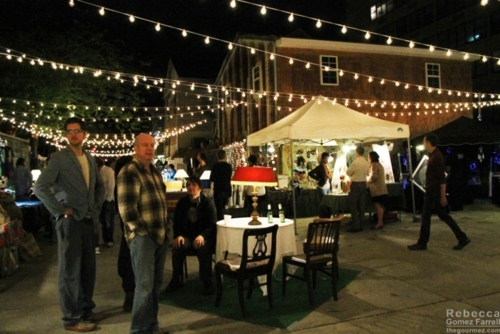 Called the Frenchman Art Market (619 Frenchman St.), it’s a great way to chat up local vendors and get a better sense of New Orleans’ people. Don’t forget to gape at all the bone jewelry and wonder whether wearing a finger around your neck would be creepy or gauche. After all that perusing, it was time for dessert. 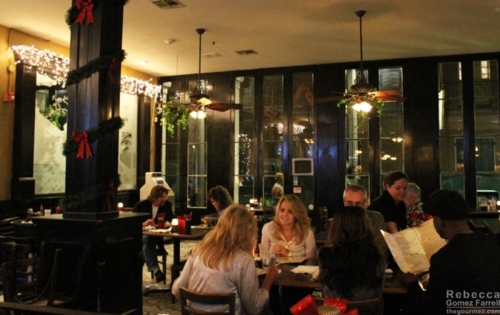 We chose Marigny Brasserie (640 Frenchmen St.). I was up to the task of eating bread pudding. Theirs was similar in shape to an inverted bundt cake, but the texture was creamy and spongy. The vanilla anglaise sauce was the best part. And thus ended Day 1 of our food adventures. 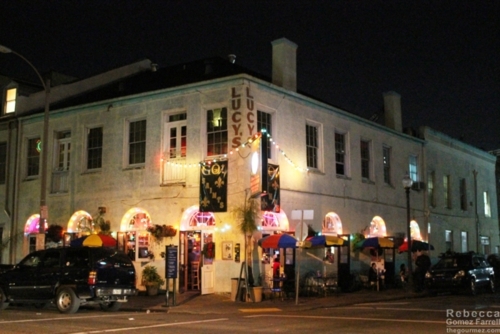 For an early dinner the next night, Ben chose Lucy’s Retired Surfers Bar and Restaurant (701 Tchoupitoulas Street), which is located in the Central Business District. 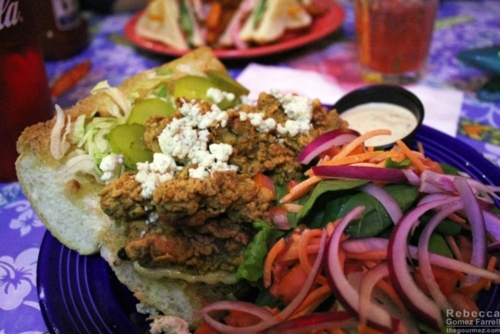 and being in New Orleans, I tried the Oyster Po’ Boy. It was satisfying though possibly holding too many oysters! The bread was delicious. But the real reason we went to Lucy’s wasn’t nourishment. It was so Ben could order a Shark Attack cocktail. That’s as hilarious of a drink as it looks. The waitress served it with two mermaids floating on top of rum and lemonade. 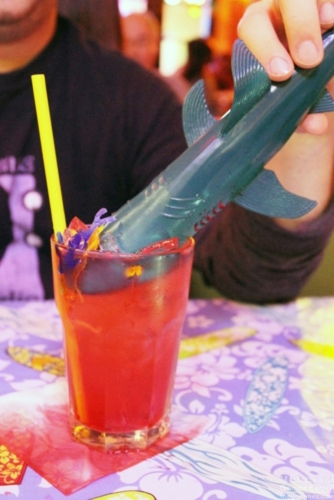 Then she dove that shark right into it, its mouth full of grenadine to provide the final ingredient: the blood of one innocent victim. The whole routine was well worth the $6. You can even keep the shark! Ours is now proudly residing on our mantel. I’m full just from looking, you say. 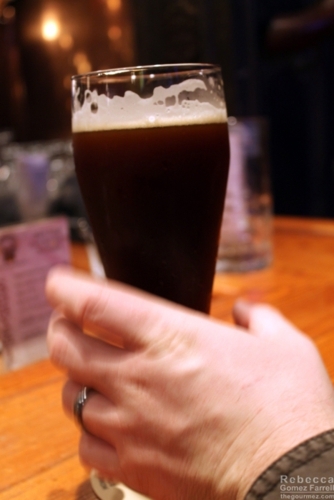 Enough time spent noshing and imbibing! That’s where you’re wrong, my friend. 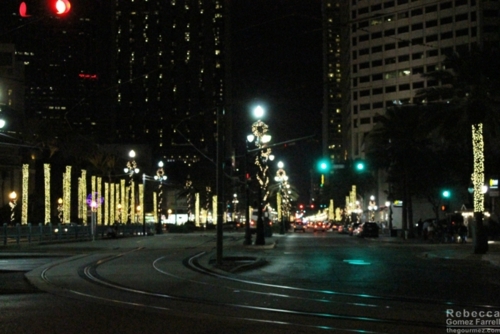 There is never enough time spent during either of those things in New Orleans. 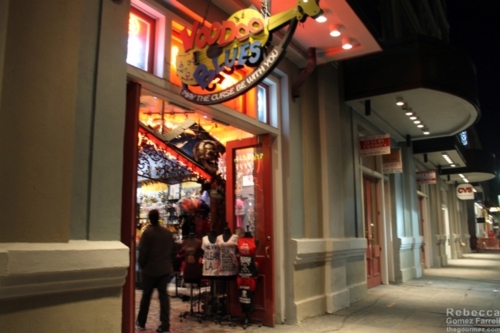 We barely made it out of the French Quarter on most evenings, and that was time well spent. In Jackson Square maybe two hours later, I dug right into more must-tastes for the tourist foodie. 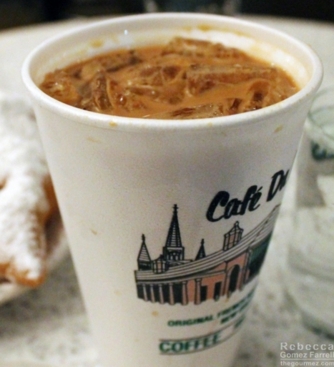 When in Rome New Orleans, Café du Monde (800 Decatur St.) is a necessity. It’s open all hours, so a nighttime nibble is the perfect time to try it. 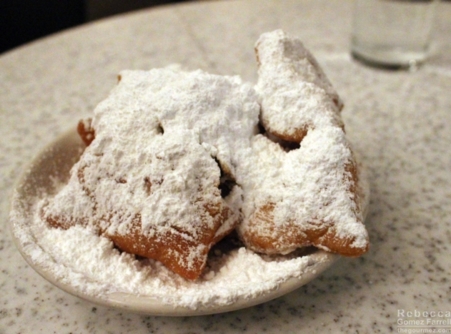 Beignets, always fresh, are the main draw. They are puffed, fried dough for those of you unfamiliar with these packets of goodness. 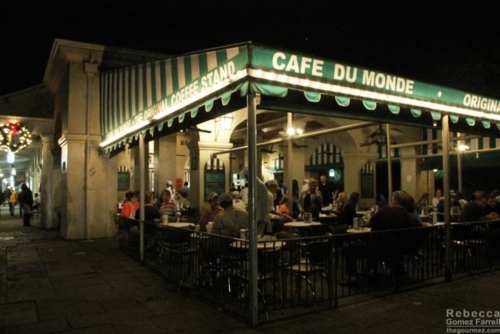 As you can see, Café du Monde covers them in an avalanche of powdered sugar. 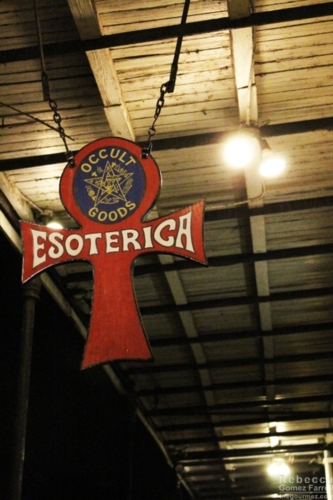 Make sure you try their coffee as well, as they are the primary purveyor of New Orleans’ unique bean and chicory brew. 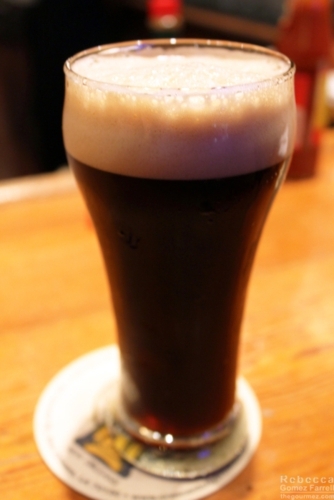 I had mine iced and mixed with half-and-half in the traditional style, though I’m normally a black coffee drinker. The chicory definitely gives it a fun layer of depth. Forswearing beignets for some unknown reason, or because HE’S CRAZY, Ben took us in pursuit of an appetizer. 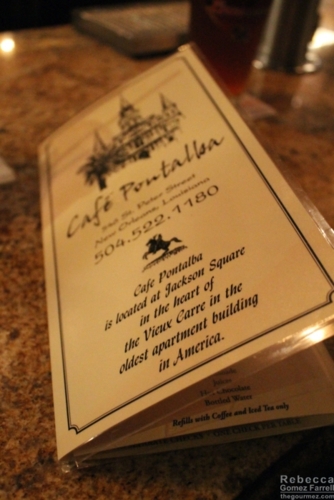 Café Pontalba (546 St. Peter St.), on the exact opposite end of Jackson Square, was his choice. 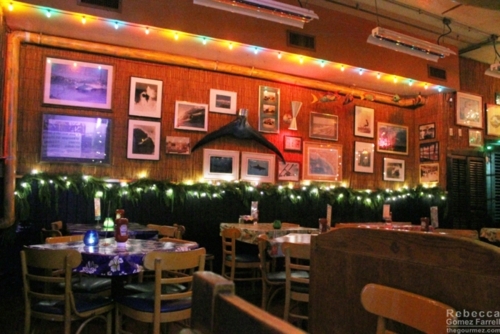 It has a relaxed, cozy pub feel. More importantly, they make delicious alligator bites! 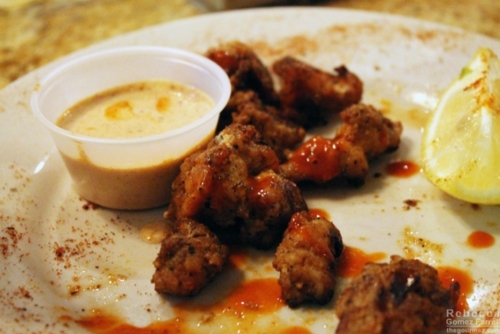 That was not my first alligator, but it was the best I’ve had. The batter was medium density with plenty of spices, the meat tender, and you know that hot sauce drizzled on top only made it better. Good call, Ben. 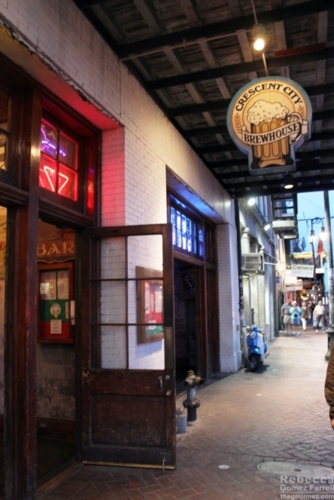 Night #3 began with an early appetizer at the Crescent City Brewhouse (527 Decatur St.), the only microbrewery in the French Quarter. 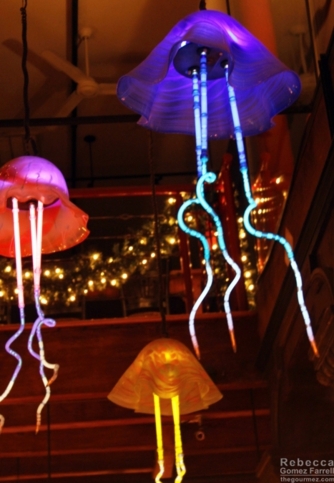 Awesome octopi above the bar. 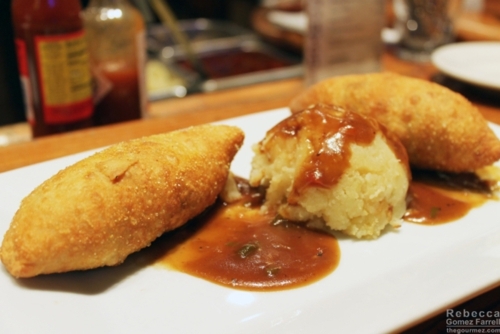 Those Cajun meat pies were very good, and so was the beer. I would avoid their cocktails, though. 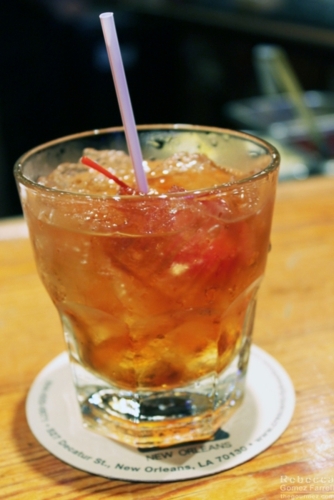 My Old-Fashioned was lacking on a few counts, and as beer is their specialty, it’s a safer bet. Also a safe bet? 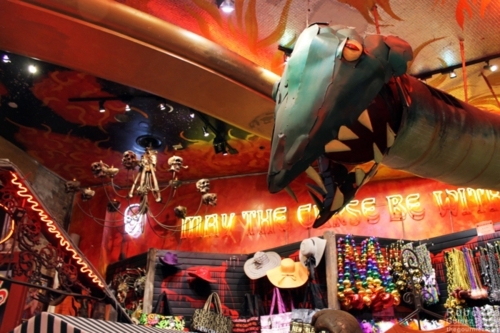 Finding a voodoo store when you need one! 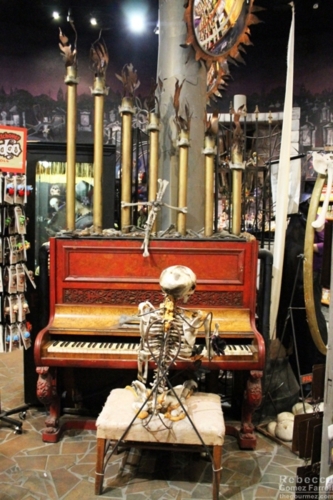 The best spots for these stores were just to the east and south of Jackson Square, and there are authentic ones with practitioners inside performing rituals and ones like Voodoo Blues that are just there to make some tourist buck. Entertain me with displays like that, and I won’t care that you’re ripping me off! 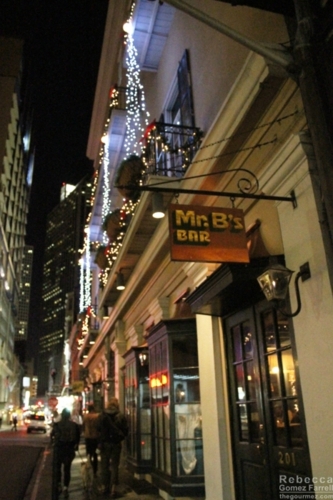 We had that early appetizer because we met my Louisiana relatives for the real deal later at Mr. B’s Bistro (201 Royal St.). 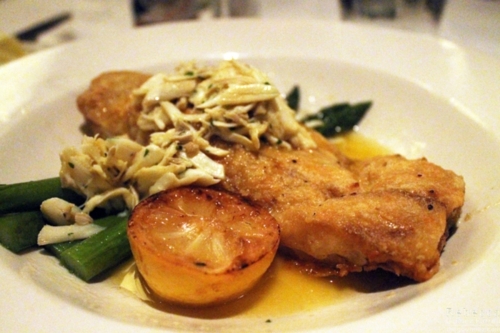 It has that old-fashioned feel of a steakhouse or Italian restaurant for your big night out on the town but the food is upscale Creole and Southern. 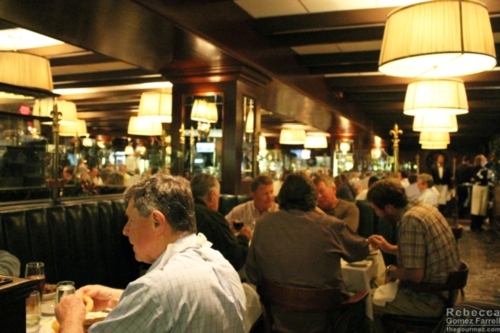 Big, leather booths, lots of people chattering in great spirits. 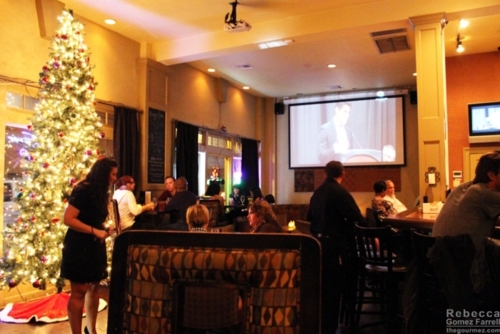 I had their tasting menu, which is always offered and includes three courses for about $50. Not a steal, but not too bad, either. 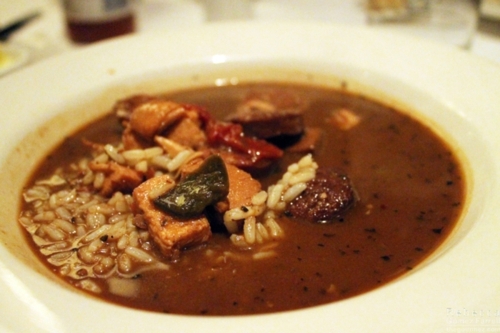 The gumbo ya ya was my first course, and it was delicious, though my cousin-in-law Jenny claims she can make it better. Since her children backed her up, I’m quite willing to believe it. The trout almondine was executed well, although it lacked inventiveness. The roasted lemon was a nice touch. My husband was happy with his braised rabbit served with garlic mashed potatoes. One dish to be sure to try, and I’m still not sure why I didn’t beyond having only met my cousin-in-law Zach a few minutes earlier, was the barbecue shrimp. It’s closer to a mussels dish than barbecue yet manages to be finger-lickin’ good all the same. 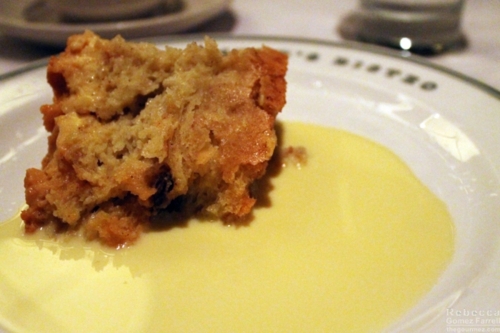 Dessert was more bread pudding, which always makes me happy. No finesse, but it was simply done and didn’t need it. What? That’s it? I swear I ate more food! Oh, I did. It was just in the daytime. 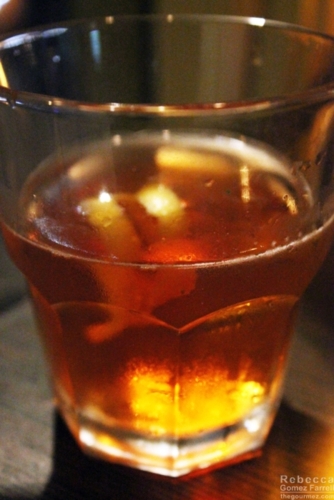 You’ll have to wade your way through the libations before we can feast again. Yes, that means cocktails in New Orleans are next on the agenda. Viva la vieux carre!